This is my first blog ever...I've never written any sort of blog and don't consider myself a writer at all, but thought it would be fun to occasionally share some things I've worked on recently in the floral world. Let me back up a bit. I've done flowers for various events for about 16 years or more, but I would only take on a few events each year, because I was focused on my career as a mother and homeschooler. As my children are older now, and don't require minute by minute attention, some good friends encouraged me to pursue my floral design work more intentionally. Kaitie Bryant, my friend, and also AMAZING photographer also encouraged me in this pursuit. I'm beyond grateful and humbled by their encouragement and HELP. Thus, this website, designed by the super gifted Latetia Vernelson of Haiku born. This event was a unique avenue to showcase some of my floral work, but it was also crazy fun to attend. There were so many talented vendors displaying their craft. I told my friends that weddings today are NOT like our parents' or even our weddings were. There are so many creative ways to reflect the personality and style of the couple. 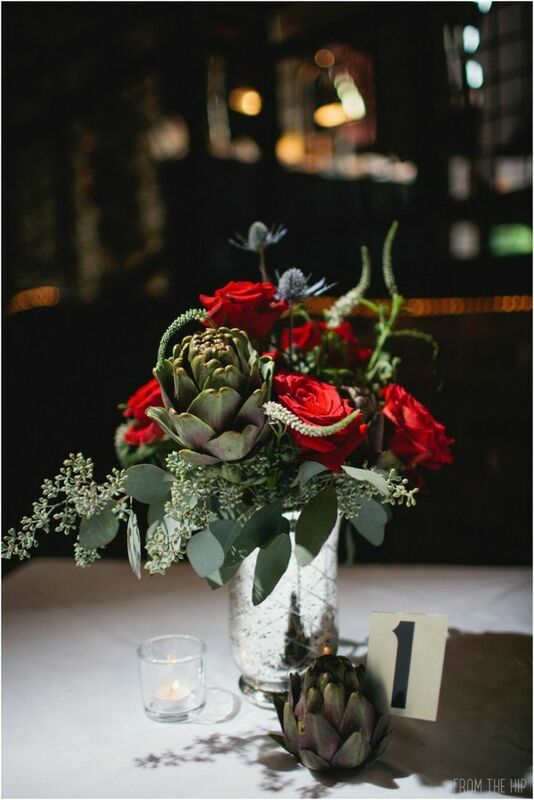 On a creative, stylistic side of things, I wanted to use a mix of traditional red roses (red corazon roses opened so perfectly), delicate anemones (red with dark purple centers), thistle (which is a personal favorite), and white veronica along with seeded eucalyptus that creates a touch of whimsy, so as not to be too formal. I wanted to add a touch of something funky, after all, we are in Athens, so the dark purple artichokes did the job quite nicely. I was beyond pleased that the attendants' dresses were that beautiful grey. The bouquets just popped next them. I was also excited to do something a little different than I've done before. That's the joy of doing floral design--I get to create something different and special for every single bride and/or event. Check out this video filmed by Incer Studios Films to see more about this fabulous event.